Members of the Meraki Guitar Quartet who played at Bridge Cottage on Saturday. A capacity audience enjoyed a vibrant performance from the Meraki Guitar Quartet at Bridge Cottage Heritage centre last Saturday. 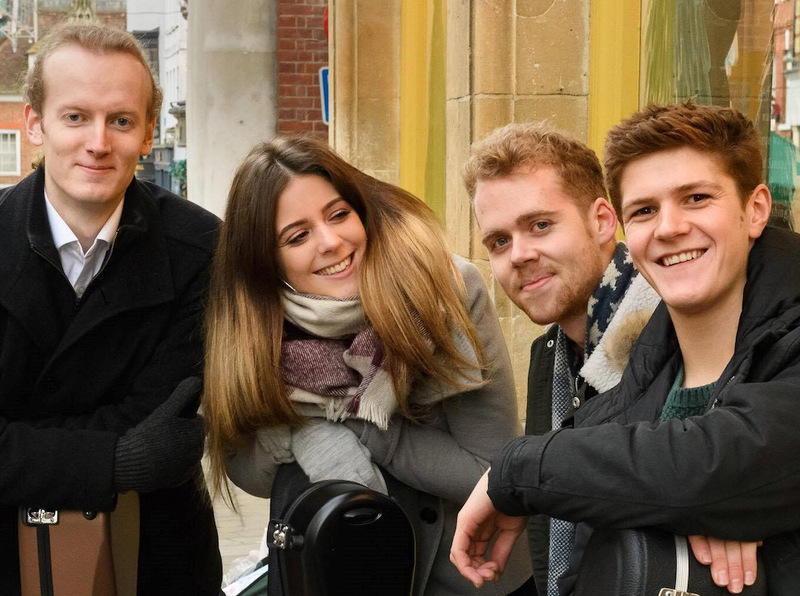 The Meraki Quartet brings together four guitarists: Will Scott, Matt House, Elizabeth Parkes and Kristian Richardson, who are all students at the Royal College of Music, studying under Gary Ryan and Chris Stell, writes Mick Harker. As a quartet they have played at prestigious venues such as Kings Place, Southbank Centre, RCM Britten Theatre and the Amaryllis Fleming Hall. This year and in 2015 they performed at the International Guitar Festival in London. In spite of the smaller venue, the medieval charm and acoustics of this Wealden Hall House enhanced the music of this unusual guitar quartet. As the open fire crackled and the candles flickered, the intimate setting allowed the audience to be completely immersed from the opening notes of Danse Macabre (Dance of Death) by Saint-Saëns. Corellis Concerto Grosso followed by regional dances from Dvorak, Grieg and Brahms to produce an exciting first half of the concert. The second half opened with Quiccan by York followed by an excellent rendering of Britten’s Simple Symphony. The groups name Meraki, means ‘to do something with soul, creativity and passion’ and, as the final cords of Crittenden’s Scottish Fantasy faded, the audience felt they had lived up to their name. Meraki were appearing as part of the Music@Bridge Cottage series of concerts. The next concert is on February 9 when Charlotte Munro, Anna Cooper and Anna Wynne appear performing a programme of music for the rare and beautiful combination of flute, viola and harp.